I’m representing a company. Can we join EFA? I’m representing a nonprofit. Can we join EFA? Who does the EFA include? How is the EFA organized? What is the relationship between the EFA and EFF? What is the relationship between EFF and groups that join the EFA? Does EFF make any requests of EFA groups? The Electronic Frontier Alliance (EFA) is an information-sharing network comprised of grassroots groups around the country promoting digital rights in their respective communities. The EFA is not an independent organization, and neither takes positions nor accepts donations. If you wish to support the EFA, please consider a donation to EFF. No. The EFA is designed for community groups, hacker spaces, and university clubs. It does not include a corporate membership option. If a group of like-minded colleagues want to form an informal autonomous affinity group, however, that group could be poised to join the EFA. If you work for or lead a company that believes in the EFA's principles, we urge you to find ways to promote those principles both internally and externally. If you would like to support digital rights, contact Nicole Puller to learn about contributing to EFF as an Organizational Member. There are a number of nonprofit members of EFA. See our list of members, read our principles, and apply for membership. 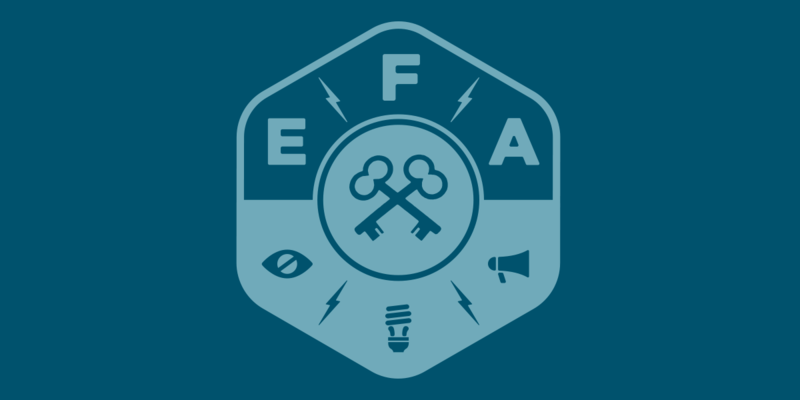 EFF administers an email listserv connecting organizers of EFA groups, and also coordinates a monthly opportunity for organizers to come together remotely to learn about each other’s projects and explore opportunities to collaborate. When joining the EFA, member groups remain autonomous. EFF does not oversee the activities that they organize in their respective areas, which include cryptoparties, hack-a-thons, workshops, teach-ins, and public discussions. EFF launched the EFA and supports the network through a coordination function. Groups participating in the network remain autonomous and pursue their respective actions independently. EFF supplies information to groups participating in the EFA and, where possible, facilitates opportunities that EFA groups are welcome to pursue independently. EFF has no authority to direct autonomous groups within the EFA network. As the EFA’s founder and coordinator, EFF reserves the right to include groups that apply to participate based on the alignment of their statements with those of the Alliance. EFF also reserves the right to remove groups from the Alliance should their actions undermine the EFA principles, or the opportunity for others to participate, in its sole discretion. EFF does not endorse commercial products or services, or the projects of EFA member groups, nor does participation in the EFA imply any joint venture or partnership with EFF. EFF encourages groups within the EFA to organize public events and campaigns that inform, educate, inspire, and mobilize local supporters to take action promoting digital rights and the network’s uniting principles. In order to include all who wish to participate, EFF suggests that EFA groups make their content freely available and their events accessible at no (or low) cost. EFF also encourages groups within the EFA to adopt an anti-harassment policy that is both welcoming and respects the speech rights of all involved. Sometimes, EFF will be engaged in a digital rights battle and invite participation from the EFA groups. Groups are under no obligation to participate. If you want to explore the EFA more deeply or have questions for EFF staff who help support the Alliance, please contact Camille, Nash, or Shahid.